WOW what a cold weekend! I wanted to get some Valentine like cards started.. but honestly it was too cold to make the attempt out to the shed for the paper and stuff, since we are still in remodelling mode. 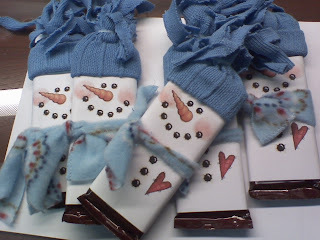 I did manage to put these cute little snowmen together... what goes better with the cold than CHOCOLATE. They are wrapped Hershey bars (and a special dark bar for the hunny of mine). I will distribute to some of the ladies at work. Too dang cute - can you bring one tomorrow to class so I can get a closer look???? Wowsers! So very cute!! How did you make them so perfect?